A long flowering Floribunda rose with magical, uniquely-coloured and lightly scented blooms. 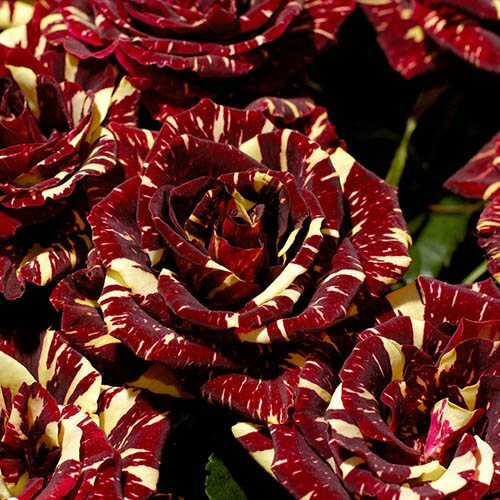 An exciting and captivating rose, the aptly named 'Abracadabra' is a unique rose bush, covered in large, striped blooms of luxurious velvet-red broadly streaked with shades of yellow. A rose bush quite unlike any other, it will give your garden, patio or balcony the wow-factor that you've been looking for! You'll be spellbound by its magical blooms, each one a different tapestry of colour and tone - you never know what to expect! This vigorous and long flowering shrub rose has good disease resistance and relatively few thorns (although not thornless) and is ideal for growing both in the garden or in a container on your deck, patio or balcony. We supply a single bare root rose bush, ready for immediate planting. Eventual height and width 70-90cm (2-3ft). An exciting and captivating rose, the aptly named 'Abracadabra' will give your garden, patio or balcony the wow-factor that you've been looking for! Covered in large, double blooms of luxurious velvet-red broadly streaked with shades of yellow, this is a unique rose bush, quite unlike any other. As well as the striking flowers, 'Abracadabra' is blessed with a light perfume, giving you even more pleasure as you study its beautiful blooms, each one a different tapestry of colour and tone - you'll be spellbound! This vigorous and long flowering shrub rose has good disease resistance and relatively few thorns (although not thornless) and is ideal for growing both in the garden or in a container on your deck, patio or balcony as long as it receives a good amount of sunshine. The mesmerising blooms contrast beautifully with its glossy green leaves, making a real eye-catching feature plant. A member of the floribunda family of roses, Abracadabra has an attractive upward, bushy habit, and its remarkable flowers are produced in clusters from April until the first frosts, so you'll get months of colour and ample opportunity to fill a vase with the glorious blooms. Supplied as a grower quality bare-root bush. Grows to 1m tall.